Download Swami Vivekananda Motivational Quotes & biography free via AppsHawk. Swami Vivekananda is one of the most inspiring personalities of India, who did a lot to make India a better place to live in. within a short span of time, he achieved a lot and went a long way in serving humans. He was the principal disciple of Sri Ramakrishna Paramhansa. Well, in this article, we will provide you with the Swami Vivekananda biography that will give you valuable insight into the life history of Vivekananda. Swami Vivekananda was a Hindu monk and a patriotic saint of India. According to English calendar he was born on 12th January 1863 into an aristocratic Bengali family of Calcutta. However his birthday is celebrated according to Hindu calendar and this day is known as Swami Vivekananda Jayanti. Vivekananda was born on Krishna Paksha Saptami after seven days of Paush Purnima. As Jayanti day is decided based on Hindu calendar, it is not fixed on Gregorian calendar like Rabindranath Tagore Jayanti and Mahatma Gandhi Jayanti which are celebrated on fixed day on Gregorian calendar. 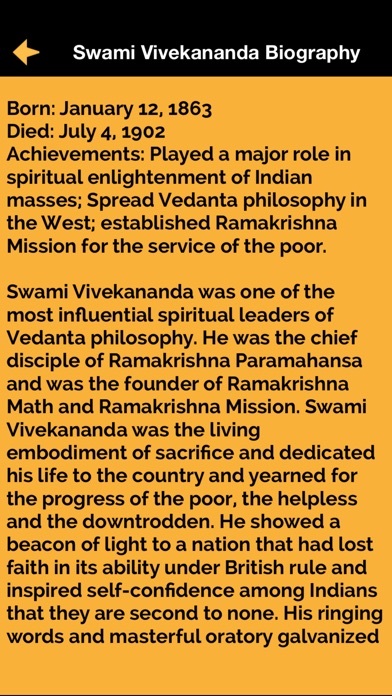 He was a follower of Vedanta philosophy of Hinduism. He was disciple of Ramakrishna. He founded Belur Math, Ramakrishna Math and Ramakrishna Mission. The Rama Krishna mission was founded by Swami Vivekananda, the chief disciple of Sri Ramakrishna Paramhansa on the 1st of May in the year 1897. The Vivekananda Ramakrishna mission is actively involved in the missionary as well as altruistic works such as disaster relief. The disciples that are serving the mission consist of both monastic and householder. Its headquarters are based near Kolkata, India. He compiled a number of books on the four Yogas, namely Raja Yoga, Karma Yoga, Bhakti Yoga and Jnana Yoga. His best literary works include the letters written by him, which have a lot of spiritual value. He maintained a very simple style of writing, so that the laymen, for whom the message is meant, are able to understand his each and every word. He was not just actively involved in writing, but also was a great singer and composed several songs. Swami Vivekananda was a great social reformer and a very inspiring personality. He was the pride of India. He made an immense contribution to purify the souls of people. He always said that God dwells inside every heart. He was of the opinion that, a person who cannot see God in poor and unhealthy people, but claims to see God in the idol, is not a true worshiper. 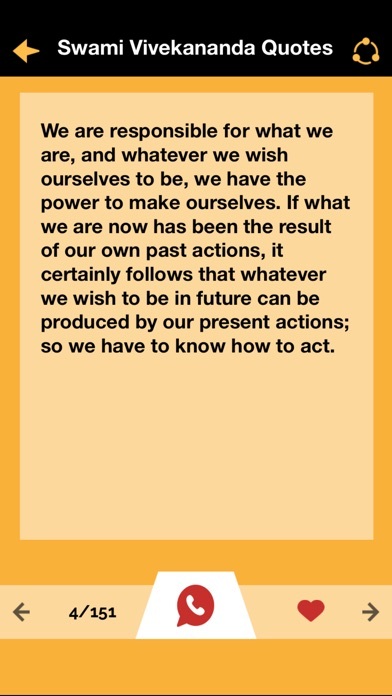 Swami Vivekananda Quotes app bring together the most ionic and conceptual quotes from Swami Vivekananda. It's quite simple to use and even non technical person can use this quote app easily. With this free app one can easily enter the mind of famous Swami Vivekananda and can find the way they think to guide their life. So, motivate yourself right now by downloading and sharing these inspirational quotes from this great mind. 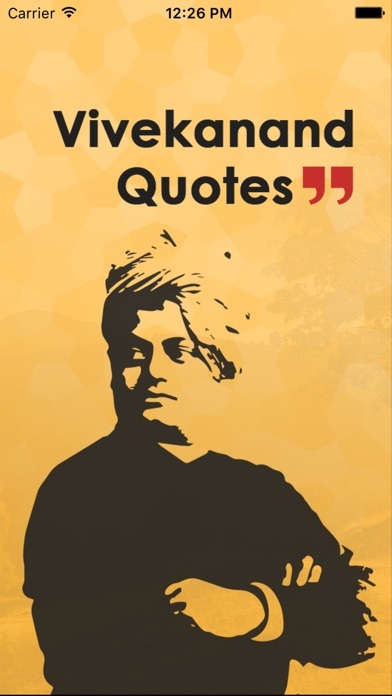 Swami Vivekananda Quotes in Hindi is collection of most conceptual and iconic quotes of swami vivekananda. This app is quite simple to use. Everyone can use and task advantage of swami quotes. 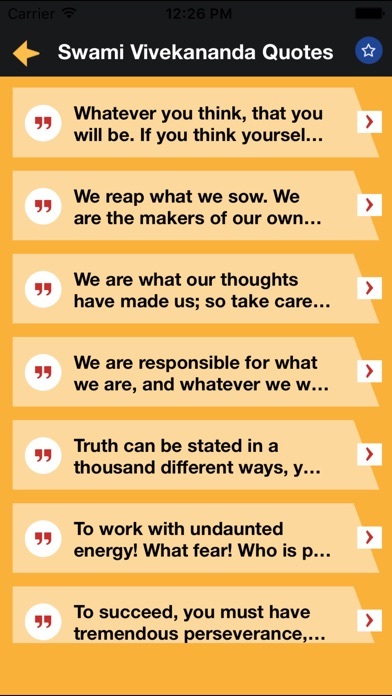 Motivate yourself by downloading and read quote of swami Vivekanand. if you like quote you can share through social network like Facebook, Whatsapp etc. Swami Vivekanand was one of the key figures to introduce Hindu and Indian philosophies to the western world. 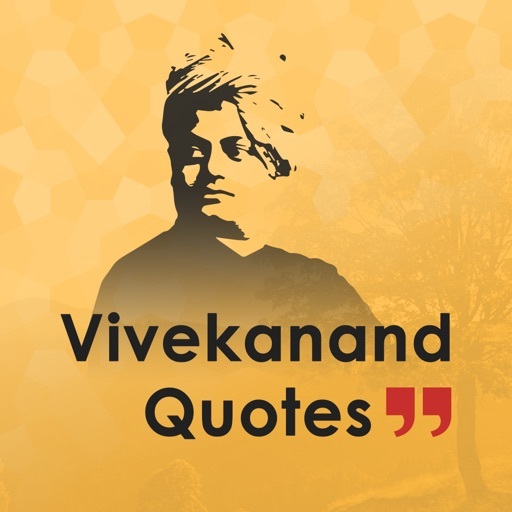 This app contains a complete collection of Vivekanandâ€™s quotes and sayings that can act as a path to self knowledge and peace. Our application is a powerful combination of spirituality and knowledge that can enrich your perspectives on life.